15 January 2019 – On 8 January 2019, United States (US) Secretary of State Mike Pompeo embarked on a week-long trip to the Middle East and Arab Gulf, where he met with various leaders and high-level officials to discuss critical regional issues. 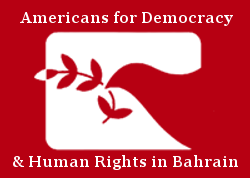 Americans for Democracy & Human Rights in Bahrain (ADHRB) is deeply disappointed with the lack of public attention given to the issue of human rights in Bahrain during the Secretary’s meetings with Bahraini officials. Additionally, ADHRB is concerned that Secretary Pompeo did not make an effort to meet with human rights defenders and members of the political opposition during his time in the kingdom. During Secretary Pompeo’s meetings with Bahraini leaders, he failed to address any human rights concerns, including the imprisonment of human rights defender Nabeel Rajab for tweets critical of the government or the life sentence handed to political leader Sheikh Ali Salman on the basis of arbitrary charges – both of which the State Department has previously condemned. Instead, Secretary Pompeo undeservingly praised the Bahraini Government for its support for religious coexistence and freedom of religion, and the conclusion of parliamentary elections. Bahrain, which is run by a Sunni ruling family, systematically discriminates against its Shia majority population. The State Department’s own most recent Religious Freedom Report noted that the Bahraini government continues to “question, detain, and arrest clerics, community members, and opposition politicians associated with the Shia community.” This past Ashura, a prominent holy day for Muslims and particularly the Shia Muslim community, there were reports that at least 15 Shia religious figures were harassed, interrogated, or taken into custody in the span of one week. Additionally, since 2012 over 800 Bahrainis have had their citizenship revoked – the majority of them being Shia. The parliamentary elections held in Bahrain this past November, which Secretary Pompeo praised during his visit, were neither free nor fair, and garnered a significant amount of international criticism. Prior to the elections, members of the US Congress, the European Parliament, and the UK, Irish and Italian Parliaments, raised concerns regarding the political environment in Bahrain ahead of elections. Following the elections, a German Green Party spokesman even called them a ‘farce.’ The opposition was effectively banned from fully participating in the elections. All of the major opposition societies remained forcibly dissolved and new legislation banned anyone who had belonged to one of these political groups from ever seeking elected office. Additionally, the elections had no independent election monitors or observers, and historically, the gerrymandering of electoral districts in Bahrain has diluted the influence of Bahrain’s Shia majority population. It is concerning that Secretary Pompeo made no mention of human rights, and solely focused on discussions of security and cooperation, when meeting with Bahraini officials. Human rights should be considered a key pillar in establishing security and stability in the region. ADHRB calls on the US government, the State Department, and Secretary Pompeo to not let Bahrain’s human rights violations go unnoticed and to urge the kingdom of Bahrain to take concrete measured to improve the human rights situation in the country.